We all want to save the planet, but unsurprisingly nobody really wants to pay for it. Fortunately this diabolical dilemma has been solved through the miracle of recycling. What the Tax Taketh Away, The Tax Giveth Back (terms and conditions apply, and if you’re in the steel industry try not to look too smug). Just as saving Australia from the Global Financial Crisis involved us battlers selflessly choking down a wodge of cash for our country, it seems the same principle can also save the environment from Global Warming, or at least look like it might be sort of nudging things in the right direction a very little bit. It will be interesting to see if it can save Julia. 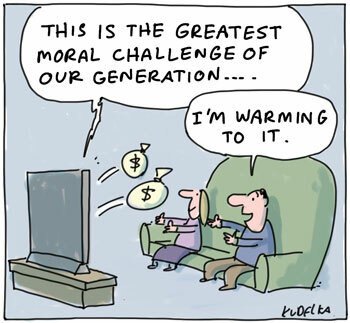 Posted in political cartoons, The Australian and tagged carbon tax, cash, moral challenge. Don’t mind being paid to sequester the A-Bott’s PM aspirations! Selling my soul, on stupid. Dumb is, as dumb does … go julia! Is this not the way Howard Costello bribed voters? It is indeed a noble tradition of electoral bribery handed down from government to government through the ages.